Watch out! China's currency is likely to tumble further before the end of the year, according to a CNNMoney survey of economists. 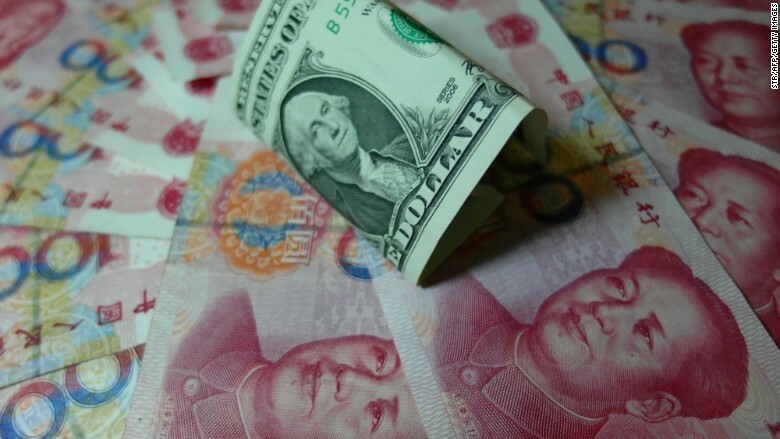 The yuan, also called the renminbi, is expected to slide another 2.8% against the U.S. dollar by the end of 2015, according to the survey's median estimate. That might not sound like a major decline, but it is a big move for the tightly-controlled yuan. The currency has already fallen 2.6% against the dollar since January, the vast majority of which came during a two-day drop in early August that stunned investors and contributed to a global stocks selloff. In addition to the surprise depreciation, the central bank changed the way the yuan's 2% daily trading band is set -- a calculation that now uses the previous day's closing price instead of the bank's own opaque process. The move pushed currency markets into a tizzy, and set off a wave of speculation over how much further the currency might drop. Looking ahead to 2016, one of the economists surveyed by CNNMoney said the yuan could dip to 7.50 against the dollar by the end of the year -- a 17.8% slide from current prices. While other 2016 forecasts were less dramatic, there was a broad agreement among the economists that the yuan will continue to depreciate as China adjusts to slower economic growth. Uncertainty over interest rate hikes by the U.S. Federal Reserve was also adding to worries. "Further devaluation could trigger further capital outflow that weighs further on the economy," said Jianguang Shen of Mizuho Securities. There's already been a lot of money leaving China for safer havens -- around $36 billion in outflows in the first half of the year, with more expected in the second half, according to Goldman Sachs. A property slowdown, volatile stock market and poor corporate profits -- on top of the devaluing yuan -- are giving investors fewer reasons to stay. Experts are also worried about the impact of further yuan devaluation in Asia. Countries with large export volumes to China, such as Hong Kong, Malaysia and Thailand, could be negatively impacted. The fear is that Asia could find itself engulfed in an all-out currency spat. "We believe the most exposed economies may be tempted to cheapen their currencies to mitigate some of the negative impacts of renminbi depreciation," wrote Credit Suisse's Dong Tao in a research note.